There are times when things that I consider self-evident and not worth bringing up. This should be one of them, but given recent events, what is obvious to me doesn’t seem real obvious to others. Just as a little background let me say I served over 13 years in the Army. I served during the early 70’s while there was still a draft. I served after the draft ended and VOLAR began. So I have seen a good number of changes of how the Military operates. Yesterday, thank God, a 19 year old young lady, Pfc. 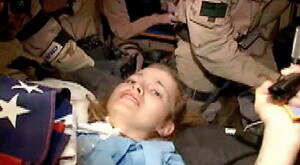 Jessica Lynch by name was extracted from capture by Special Forces. Ms. Lynch was a very, very lucky young lady. She hails from a small town in W. Va., where the local economy is depressed and the unemployment rate is around 15%. But she had a dream to become a teacher and needed money to attend college. She felt the Army was her best choice to make her dream come true. She certainly received an education, but not the one she was saving or planning for. I would never try and talk anyone out of serving their Country. I in fact encourage it, but I encourage doing it for the right reasons. So this is my little bit of advice, for what it’s worth, to the parents of children coming of age or of age and to those who are of age or coming of age that happen to read us here. Like everything in life there are right and wrong reasons for doing things. Joining the Service for education funds is not necessarily a wrong reason, but my advice is to think really long and hard on which service you pick to do that. There is much more to being part of the Service than a nine to five job, as we all see these days on our TV’s. The risk aside, it takes something a bit special and more of a reason to join and serve than the money. Duty to ones Country is something that should ring in at the top of the list for reasons. We all owe a certain amount of service to our Country, in my humble opinion, and a duty to honor those who went before us to preserve the freedoms we enjoy today. Military Service takes a large toll on everyone that joins, again in my humble opinion, what makes that toll easier to accept is remembering why you are there in the first place. Faint hearts and half-measures get yourself and/or other people killed. Before you think about the bennies think about the cost. Talk it over with parents and others who have been there and weigh carefully the balance of Service. Be sure you have more in mind than an escape from something or a profit motive. Frankly those who don’t have duty, honor and Country on the top of their list of reasons, in my experience, are those who have the hardest time and cause others a lot of grief. This by no means says that there aren’t exceptions, but my years of service does tend to show it as the rule. God Bless all you youngsters that do sign on, that serve, that protect us, and as now, strive to free people we don’t even know. In the truest sense of service before self, there you are and we and those who follow us owe you all more than just kind words or a few dollars. May God protect every one of you.